So is SureTrader really legit? Do they charge horrendous commissions on each and every trade? And what about their platform – is it any good for fast-paced day trading? These are all valid and fair questions that day traders ask and that we’re going to tackle one by one in this SureTrader review. SureTrader allows US-based traders to day trade with less than $25,000 in their account, thus avoiding the PDT Rule (the Pattern Day Trade Rule). SureTrader offers support (account or platform related) via phone, email, or live chat. Setting up a SureTrader account is quick and easy. With more than 10,000 stocks, SureTrader has one of the longest stock lists of any online broker. It is best that US traders with more than $25,000 available not use SureTrader as there are cheaper and better alternatives available such as Center Point Securitiesand IB (Interactive Brokers). SureTrader’s location in The Bahamas could be a problem due to less stringent regulations than are found in countries such as the United States. With that said, offshore jurisdiction is not uncommon in the financial sector. The International Business Companies Act has allowed The Bahamas to become an established corporate and financial hub for many North American investors. SureTrader is listed under the Securities Commission of The Bahamas and is regulated by them. Based on reviews, some day traders seem to have had issues with the SureTrader platform as well as with the withdrawal of money from their accounts. In 2016, the founder and CEO of SureTrader was charged by the US Securities and Exchange Commission for perpetrating penny stock manipulation schemes. In January of 2017, the court dismissed the charges. 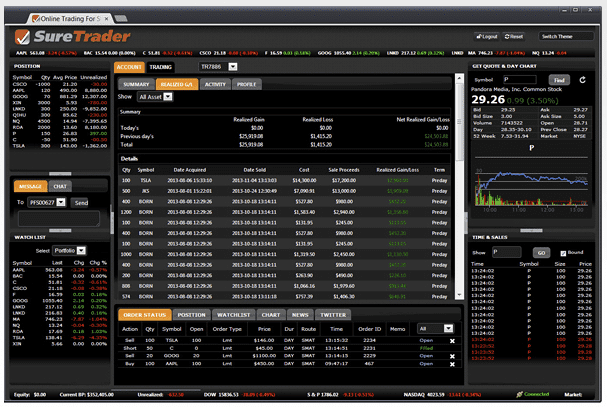 SureTrader’s platforms only work on PCs running Windows. Mac users have to buy a special software such as CrossOver, Parallels or Boot Camp in order to be able to use them. Although SureTrader was a pioneer in offering a wide variety of services to day traders, it is no longer the only option, and attractive and cheaper alternatives are now available for traders. Although SureTrader was a pioneer in offering services to day traders who were looking to bypass the US PDT Rule (not being able to trade with less than $25,000 in their account), it is no longer the best choice. Alternative brokers are now offering the same services and at lower prices. Examples of these brokers are Capital Markets Elite Group Limited and Alliance Trader. CMEG specifically is offering a $2.95/trade commission to the Bear Bull Traders community. If you are in the USA and have more than $25,000 available for day trading, you should not use SureTrader. We advise you to open an account with Interactive Brokers (IB) or Center Point Securities. If you are in the USA and have less than $25,000 available for day trading, we recommend using CMEG. And yes, we do realize your head may be spinning with all the broker names by now. That’s why we’ve compared them side by side over here. According to US regulators, day traders based in the USA need to have at least $25,000 in their trading account. This is known as the Pattern Day Trade Rule. This rule is applicable to US citizens, Green Card holders and even temporary residents of the US based brokers such as Interactive Brokers (IB) or Center Point Securities have no choice but to enforce this rule since they are located in the United States and are therefore regulated in the United States. SureTrader enables you to bypass the PDT Rule and day trade with less than $25,000 in your account because they are based outside of the USA, and therefore do not need to enforce the notorious PDT Rule. SureTrader was founded by Guy Gentile in 2011. Gentile previously founded SpeedTrader, one of the best brokers in the US for day trading. Less than a year after its establishment, SureTrader reported more than 100,000 equity transactions daily. Its success prompted a major expansion to meet scaling demands, and the firm set out to increase staff by 200% during March 2012. In May 2012, SureTrader reported averaging 30,000 transactions daily. On March 23, 2016, Gentile was charged by the US Securities and Exchange Commission with perpetrating penny stock manipulation schemes but the charges were dismissed the following year. At the time, this lawsuit was a significant reason for traders to avoid opening an account with SureTrader. SureTrader has been in business since 2011. The company is based, licensed and regulated in The Bahamas by the Securities Commission of The Bahamas and The Central Bank of The Bahamas, and they are expected to strictly adhere to established standards of performance, service and confidentiality. In addition, SureTrader’s financials are audited by BDO Bahamas. As mentioned, SureTrader’s main attraction for retail traders is the ability to bypass the United States’ pattern Day Trade (PDT) Rule, due to SureTrader’s location in The Bahamas. Because of this, SureTrader continues to draw in traders who are below the $25,000 PDT level, so those with small amounts can trade as much as they want. Therefore, with a minimum deposit of $500, you can join this broker and start trading. If you open an account with SureTrader, and your account grows, we recommend you regularly withdraw your cash so that you never maintain a considerable sum of money in your SureTrader account. This way, you will then not lose a significant amount of money should SureTrader ever file for bankruptcy or run into other problems. As previously noted, SureTrader is not allowed to actively recruit US clients. They accept US clients, but they are not allowed to directly advertise to US clients. SureTrader’s trading fees were high and that was a major downside for many traders. Recently they reduced their fees to $0.005 per share with a $1.95 per share minimum (at the time of writing), but that is still considered a high commission structure among the industry. High volume traders, those trading more than 1,000,000 shares per month, pay lower trading fees, but they need to discuss their situation with SureTrader in order to access the lower rate. At the time of writing this SureTrader review, SureTrader offers a 6:1 intraday leverage and 2:1 overnight leverage on marginable stocks above $3 with a $500 account minimum. This is an excellent buying power for traders who have limited cash in their account. The lack of pattern day trading rules means SureTrader caters to pattern day traders and those who are just starting out with less than $25,000 available for trading. SureTrader also offers a similar 6:1 intraday leverage and 2:1 overnight leverage on marginable securities above $3 with a $500 account minimum. Again, this is excellent, because people with less capital available for day trading usually need to use their margin in order to make a significant profit. Leverage can only be used on accounts with equity exceeding $500. Accounts with $100 will be liquidated in their entirety. Stocks below $2.50 require a $2.50 per share equity requirement (the $2.50 Rule). For example: If you short 1,000 shares of stock valued at $1.00 per share, you will need at least $2,500 equity in your account. However, please note that SureTrader, like any other broker, may limit the use of margin on volatile stocks. For example, if a stock is very volatile, your buying power on that particular stock may be limited to 2:1 or even 1:1. This is because SureTrader does not want to assume the risk of loaning you extra buying power on risky trades. This approach is common among many other US-based and offshore brokers. There are three platforms in total to choose from: Activeweb, SureTrader Pro/Desktop (which is the same as DAS Trader Pro) and their mobile-based app and iOS app (which is the same as DAS Trader Pro’s mobile-based app). The main platform you should use is SureTrader Pro (the renamed version of DAS Trader Pro) which you can read more about here. Please note: SureTrader’s platform only works on PCs running Windows. Mac users have to buy a special software such as CrossOver, Parallels or Boot Camp in order to be able to use them. This is a 100% free web-based trading platform included with their service. Thanks to its web-based feature, traders can enjoy real-time streaming data and a seamless trading experience. This makes it ideal for day traders looking to dip into the world of trading without spending a single dime for the so-called tools of the trade. In addition, the platform offers users quick order entry and intraday charts. This is the platform you should use. Also known as a desktop-based platform, this is a premium trading platform that makes use of a direct-access software. It starts at $49 per month – at the time of writing this SureTrader review – and is designed for day traders looking for more customization options, more trading capabilities, and more functionality. The platform boasts fully-integrated point-and-click trading with plenty of advanced features for traders and is highly organized for ease of use. It also provides users with real-time news as well as both profit and loss display. SureTrader offers different styles and types of charts with customizable options, so you can view real-time price movements, bar charts, and candlesticks and even set multiple data points against them including moving averages. Additionally, users can set their charts to different time frames. Mobile SureTrader is free to all Pro platform users. It’s a responsive, web-based trading platform designed to work on any smartphone. Some traders may like this mobile trading platform so much that it will become their primary trading method. There’s no need to stay chained to a desk or computer. This day trading web app is also ideal for part-time traders, who can make trades while enroute to and from their workplace or during downtime. When traveling, trade from any time zone. Mobile trading is never further away than your pocket. With modern technology, trading via your smartphone is as safe and secure as trading from your desktop or laptop. iDASTrader with Level 2 Quotes is an iOS app for the Apple iPhone. Its numerous features include the ability to view your account status, to get quotes and to place trades. If you are new to trading and looking to develop your skills without risking your money, the SureTrader platform provides traders with a free demo account. 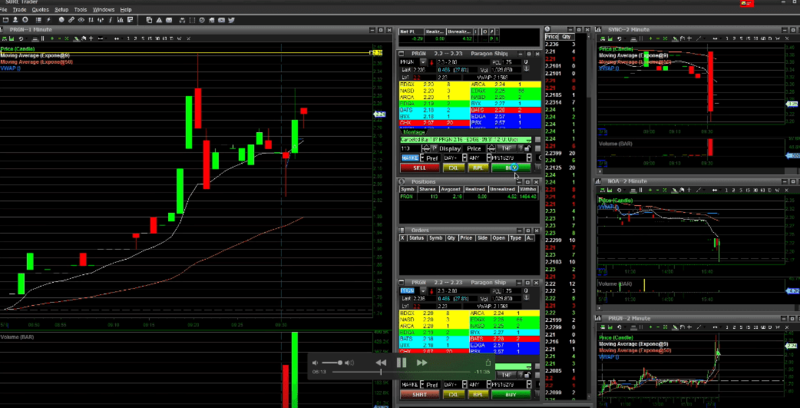 This account can also help you learn both the ins and outs of day trading as well as master how their platform works. Additionally, you can use this demo account to develop your own trading strategies. You need to ask for this demo account though as SureTrader is not offering it to traders by default. SureTrader takes security very seriously. The broker is regulated by the Securities Commission of The Bahamas and are required to adhere to all international standards. In addition, SureTrader uses cloud-based SiteLock and Secure Sockets Layer (SSL) for an added level of protection and confidentiality for the personal data stored in their accounts. SureTrader provides live support between 8:00AM and 6:30PM Eastern time, or you can open a support ticket and a support agent will reply within 24 hours. SureTrader is known though to provide fairly slow customer service. This is primarily because they are overloaded with new traders and beginners who do not know the basics of trading, and do not know how to properly use their platform. SureTrader provides several different ways to contact them via phone, email, or live chat, but be prepared to experience delays. It is recommended that one learn their trading platform properly before beginning live trading. On the positive side, setting up an account with SureTrader is a relatively quick and easy process. To conclude this SureTrader review, we think that although SureTrader was a pioneer in offering a wide variety of services to day traders, it is no longer the only option. At the time, SureTrader still is a solid option if you’re looking to trade with less than $25,000 in starting capital.